Nitecore Q4 Charger Review | Affordable 4 Bay Vape Charger - Daily Vaping Deals & The Best Vape Product Reviews at Vaping Cheap! Nitecore is back yet again with another vape charger, and is the next addition to the Q Series line of chargers, which is the Q4. Unlike the Q2 charger which we reviewed previously, the Q4 is capable of charging 4 batteries simultaneously, and offers up to 2A charging, allowing you to quickly charge your preferred battery. Just like other chargers Nitecore has released in the past, this one has a ton of features and most importantly, safety features. Before getting any further into this review, we’d like to thank Nitecore for sending this vape accessory our way for the purposes of this review. We’ll cover our first impressions, usage, pros and cons, and conclude with whether or not we recommend the Nitecore Q4 Charger! Click Here to Check Out the Nitecore Q4 Vape Charger! We did receive the final retail packaging of the Nitecore Q4 charger, and just like other chargers reviewed in the past by Nitecore such as the i8 and SC4, this one comes in a box that keeps everything secure during transit. On the front it does say which charger is inside of the box, and on the back of the packaging there is some information such as some of the features and what battery sizes this charger is compatible with. Also, something worth noting that the color of the packaging does match the color of the charger I received. I’m not exactly sure if this can be said with the other colors offered, but I can assume so. The color I did receive is the Pinky Peach, and the other colors available are Lemonade, Blackberry and Juicy Mango. If you’re interested in seeing what the Juicy Mango color looks like, be sure to check out our review of the Nitecore Q2. Both of these models are available in the same color options, and it’s great to see chargers being available in different colors rather than one set standard. Once you slide open the packaging, you’re met with the charger and basically everything that’s included which is the power cord, a user manual, and warranty card. The charger itself is quite small, especially considering it’s a four bay vape charger, which is a definite pro in my book. This makes it easy to travel with and easy to store in your home. This charger won’t be taking up much space at all. Just like the Q2, it features a see through kind of design, where you can basically see all of the internals of the charger. 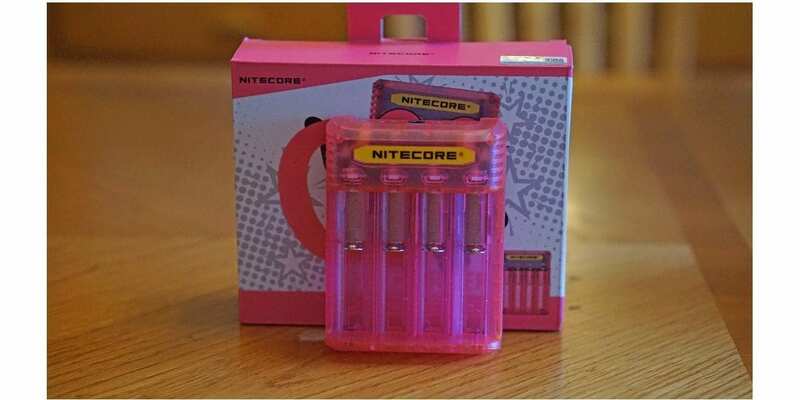 On the front, it does have the Nitecore branding, and four slots for your batteries. The springs are nice and smooth, which is yet again another pro. There are also 4 LED lights for each slot, which will let you know whether or not your batteries are finished charging. On the back there are four grips, so the Q4 will sit into place securely. Overall, my first impressions of the Nitecore Q4 four bay charger was great! I had no cons to mention whatsoever! The best part about this charger at first had to be the springs, this makes it very easy to put your batteries in and take them out. Using the Nitecore Q4 as my primary charger over the past few weeks has been nothing, but a great experience. I pretty much had no issues to complain about at all, and it performed well in every aspect. It’s an incredibly simple charger, which is great for the beginner or the advanced user who’s just looking for a charger to charge their vape batteries. Of course, a subjective con to be mentioned is that there isn’t any screen to show you any information such as the battery life, the speed it’s charging at, etc. If this is something you’re looking for, then the SC4 that we reviewed before would satisfy your needs. As mentioned earlier, the Nitecore Q4 does have a ton of features such as being able to monitor and charge each of the slots independently, capable of charging 4 batteries at once, ACD (Active Current Distribution), two charging modes (constant current and constant voltage), and is compatible with car adapters. As shown in the image in this review, this charge is capable of charging an 18650, 20700, 21700 and 26650 battery all at the same time. Now do keep in mind with these four battery sizes installed at once, it is kind of a tight fit, but it does charge them all at once. Also, with these 4 specific batteries all in at once, you do have to be careful when taking them out as you don’t want to rip the battery wraps. I never felt like this charger would, but it’s always good to be safe than sorry. It’s still a definite pro that this charger, being as small as it is, is capable of charging various battery sizes all at once with no issues. This was quite impressive, and with how popular these larger batteries are becoming, you’re definitely going to want a charger being capable of charging them. Something else worth mentioning is that there are two specific slots that are clearly marked for 2A charging, so if you wanted to quickly charge a single battery, simply insert your battery into one of those slots. The two outer slots are labeled in the sled as 2A, and the two center slots are labeled with 1A. The maximum output of the Q4 is 2000mA, but it does charge four slots simultaneously and up to 1000mA in each slot. 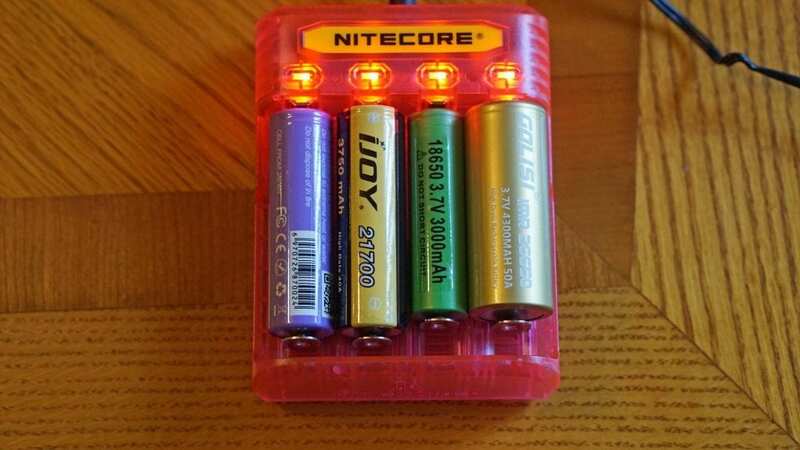 When each battery is charging, the LED will glow red, and when it is finished charging it will glow green. If there is an issue, then the LED will start flashing red. Some other features of this vape charger includes reverse polarity prevention and short circuit prevention, it incorporates an optimized IMR charging system that is able to monitor the entire charging process, ensuring the end voltage is always within safe limits which helps extend battery life, overtime protection, constructed of safe material (flame retardant and fire resistance PC materials), and designed for optimal heat dissipation. All in all, using the Nitecore Q4 has been an excellent, and is definitely staying as one of my primary chargers whether at home or on the go. In conclusion, the Q4 is another great battery charger from Nitecore that is not only affordable, but offers a ton of features. The biggest pro in my opinion is that it is capable of charging various battery sizes, including some of the newer battery types we’ve been using in vaping such as 20700 and 21700, simultaneously. This basically future proofs you, so you won’t need to buy another charger in the future if you do end up getting a new vape mod that utilizes these batteries. On top of that, all of the safety features ensure that you and your batteries are safe when in use. However, there were two cons that were mentioned, but both of them were subjective. 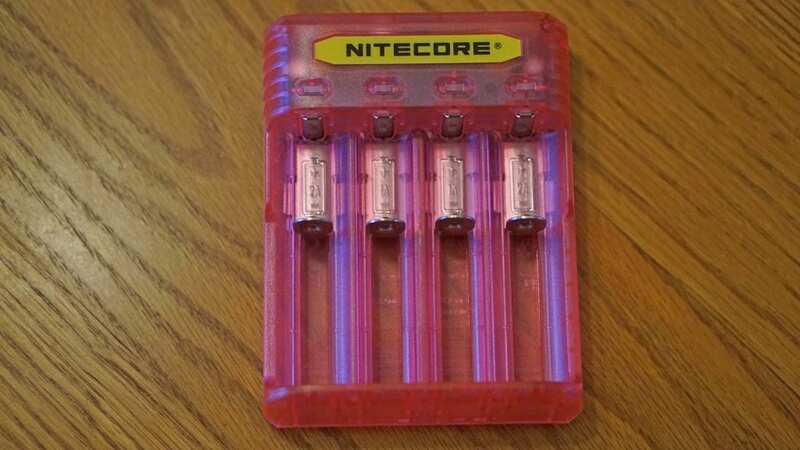 As mentioned previously, if you’re the vaper who wants to know the information of your batteries while charging, then the SC4 by Nitecore will suit you much better, but do keep in mind those type of chargers are typically much more expensive. Also, the color options may not be for everyone, but I personally like the fact Nitecore gives you the options. All in all, the Nitecore Q4 does exactly what it’s supposed to do, which is charge your batteries and do so safely. If you’re looking for a new and affordable 4 bay charger that is capable of charging various battery sizes, then we highly recommend this one. I hope this review helps you in choosing the perfect vape charger! Feel free to leave any comments or questions down below! Thanks for reading!